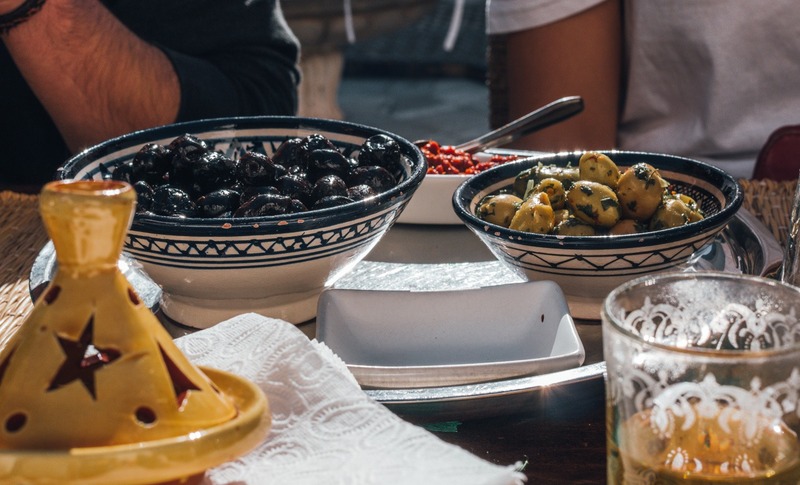 Before we left to Morocco, one thing was certain: we wanted to get to know as many facets of Morocco as possible, and of course, the culinary mustn’t be missing. The special smell of all these spices, the fresh vegetables and fruits, and tagines wherever you look. 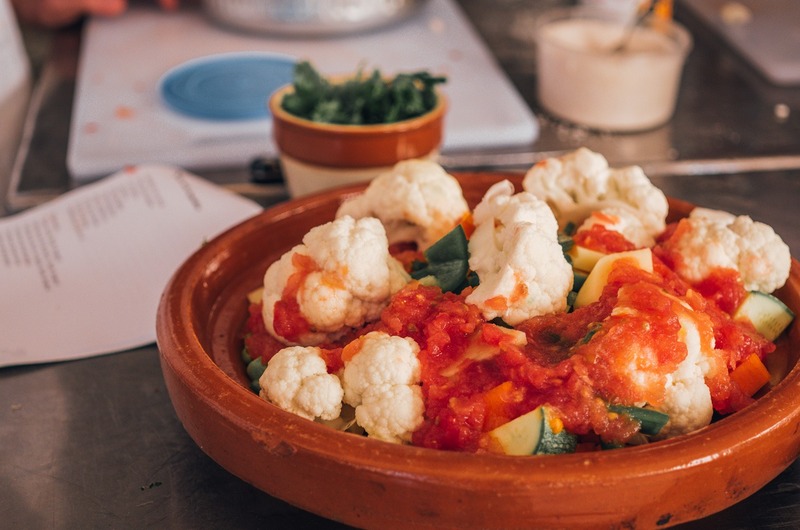 The round clay vessels are perfect for braising Moroccan dishes and are an essential part of traditional North African cuisine. 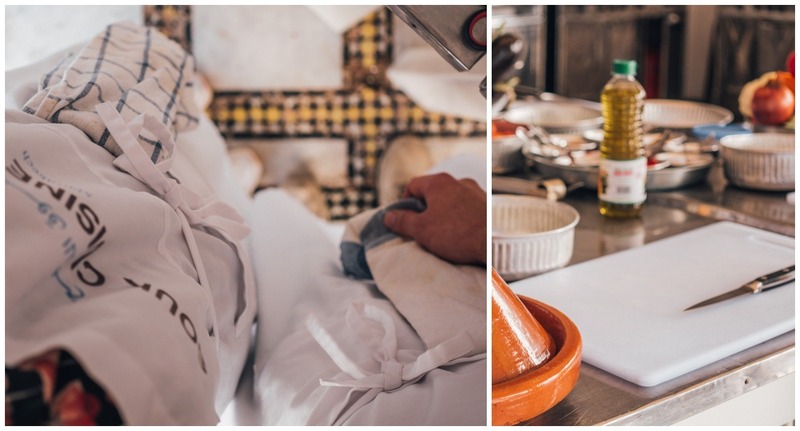 We wanted to learn how everything is prepared by locals and that’s why we decided against “teaching ourselves” and decided to take part in a cooking class in the heart of Marrakech. Said and done. 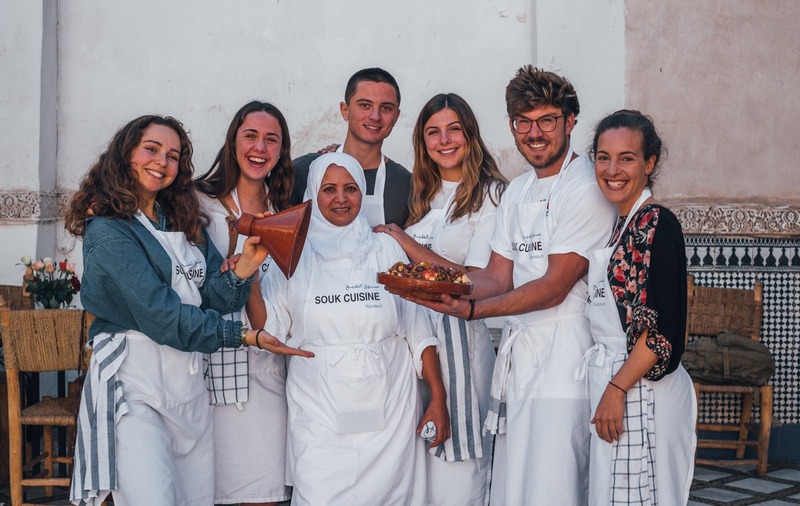 Julian searched for a possible cooking class in Marrakech and so we luckily decided in favor of Souk Cuisine, which is run by the Dutch Gemma. An exciting day was awaiting us! The meeting point was the big main square, Djemaa el Fna, where we met the Dutch Gemma at 10 a.m. Our group consisted of 6 people and after a short greeting from Gemma – who has been living in Morocco since 2005 – the day started off with shopping lists, money, and bags in her hand. Always in pairs of two, we looked for the best ingredients for a good price. 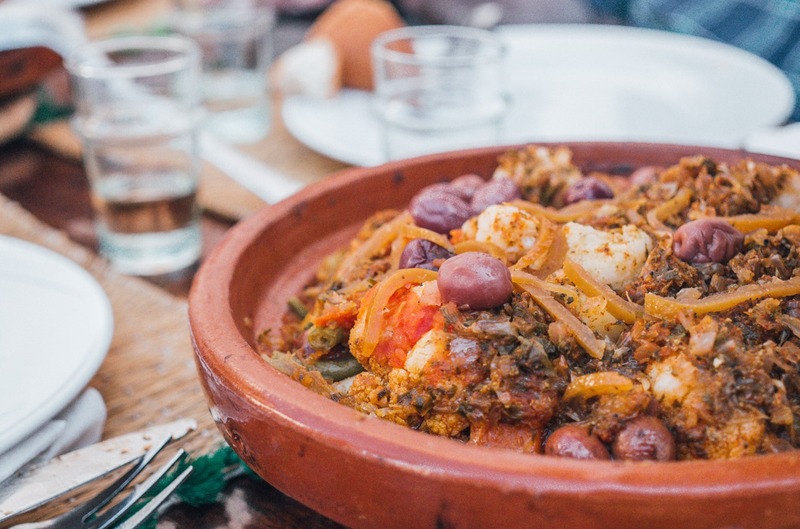 Gemma told us a lot about Moroccan cuisine and about the preparation of individual dishes. 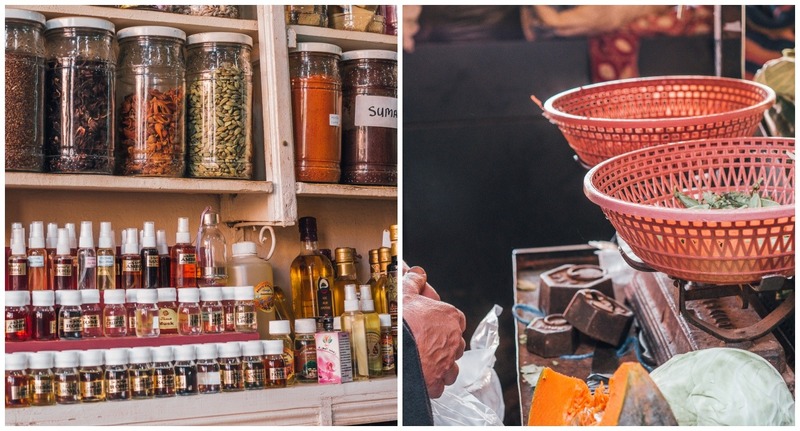 We strolled through the best markets of the city, tried “Safran for friends” and got to know the difference between this one and “Touri-Safran”, which is only sold to some tourists. Yes, incredible, but true! “Touri” saffron is made from corn and in no way has the value of expensive saffron, nor does it taste like it. But maybe it was all just a gag! We got to know new vegetables, tasted traditional Moroccan cheese with bread and bought our meat very fresh. Attention: Not the right thing for weak nerves. Ani stayed a bit further away when the chicken was killed in Halal style. As soon as we had all the ingredients in our bags, we made our way to one of the most beautiful Riads you can imagine. The location was perfect and the staff did their best to make us feel comfortable, which perfectly worked out. Besides some delicious tapas on the table, the first mint tea was already served and we came briefly to rest. The recipes of all dishes, which we were supposed to be prepared in a group of 14 people, was already on the table and made our hearts beat faster: Carrot salad with almonds and raisins, Zaahlouk, Briouates with cheese and chicken, different tagines and sweet pastries. We couldn’t wait! Each team of 6 people got assigned tasks to prepare 2-3 dishes (whether starter, main course or dessert). Let’s do it! While the lovely staff was already putting together the individual ingredients for the dishes, each group had an assisting chef. She took command of the group and helped to prepare the dishes. Our helper Khadija was here to joke! She made us work hard with lots of laughter. She didn’t tell Julian only once to chop his onion faster! During the preparation of each meal, everyone had their own task. The vegetables and fruit had to be chopped and the fresh ingredients had to be put together. So we worked as a team and helped each other with the next steps. Khadija always made sure that everything went according to plan and that everyone was equally involved. We cut everything we’ve bought, filled tagine after tagine and put the vessels on the stove where they cooked on low heat. We washed our hands over and over, added previously unknown spices to the food and our eyes became bigger and bigger when looking at the homemade dishes. After about 2 hours the last desserts were ready and the group took the baking tray with the cookies to the traditional bakery around the corner. Back in Riad, we took a seat at the long table and were extremely excited to see how our self-made food would taste. Moroccan wine was served and the first homemade dips and bread found their place on the table. If you wouldn’t have known that the main courses would be coming soon, you would have filled yourself already here! We all chatted and sat together until the staff came around the corner with the hot tagines. 3…2…1… – and up the lids! In front of us probably one of the most delicious dishes we have ever eaten. Prepared by us! Our cooking class adventure ended around 16:00 o’clock with full bellies and some great experiences richer. It was clear: We needed a tagine and some spices for our kitchen in Cologne! The day could not have been better. Chapeau to the team of Souk Cuisine! We had an incredible day, were welcomed more than friendly and could take a lot of the day with us. We would almost say: The day couldn’t have been better organized. From shopping together on local markets to preparing the dishes and eating together in the large group. Not to mention the cozy location. 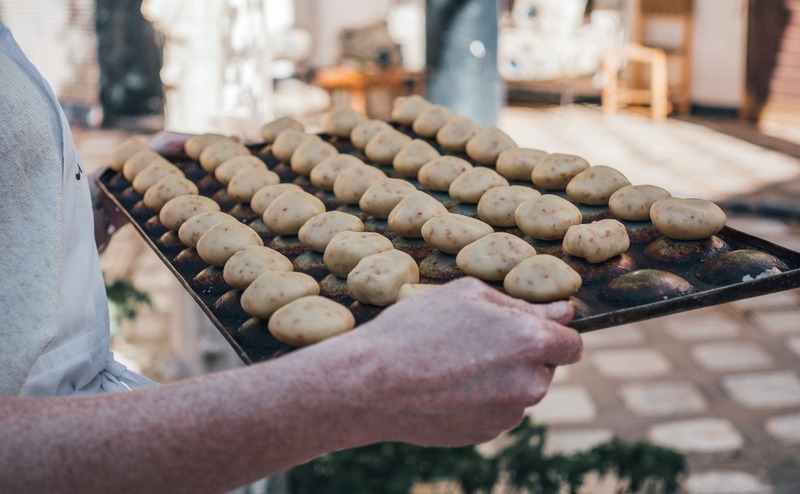 We can only recommend the team around Souk Cuisine most warmly and say: Who does not book a cooking class here, misses something! Again big praise to the whole team and thanks that we were allowed to be there! ➳ Thinking about a trip to the desert? Our article might help you to plan your trip! 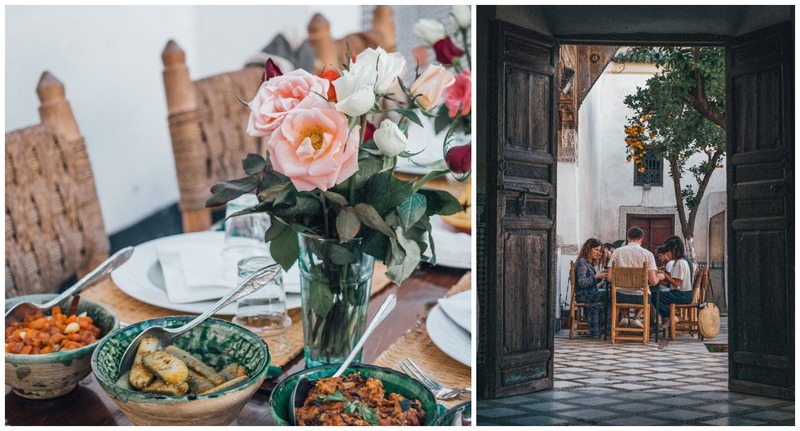 ➳ One week in Marrakech and you don’t know what to do? Head over to this article!